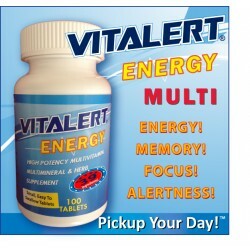 VITALERT® Energy Multivitamin, Multimineral & Herb Supplement - All Day ENERGY, MEMORY & ALERTNESS! LOADED with 39 INGREDIENTS! PICKUP YOUR DAY! IN STOCK! Major SALE! PRICE: $12.99 ($4.00 OFF EA. TODAY! - Reg. $16.99). Also FREE SHIPPING Promo! (SAVE $6.95 - Min. 4 bottles) Made in the USA!